Christmas is the time when we fervently agonize over what we want to chop, peel, stir, stuff, marinate and cook for our delicious family feasts. Will it be a traditional turkey, a seafood buffet, a desired family favourite or be inspired to try a totally new recipe creation ??? For me it was the age old dilemma - between cooking the family favourites or letting my creativity flow! 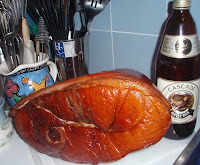 Since my first preparation of Nigella’s Coca Cola Ham eight years ago I was ordered to make it ever year since. Yet I finally put my foot down a few years ago, much to the disappointment of my family, and took it off the menu as I was tired, bored and screaming for time out!!! This Christmas though I put an end to their whingeing. While out Christmas shopping I got ‘lost’ in the cookbook section where I came upon Nigella’s Christmas cookbook where I find ….Ginger Glazed Ham... a twist on her Coca Cola ham yet simmered in ginger ale and coated in glaze of ginger preserves, mustard, cloves and brown sugar. I had found the answer that would satisfy both my creative desires and my family’s wishes! Although inspired by Nigella, I have added my own embellishments. I use ginger beer (Bundaberg or Cascade) and add a little extra cardamom into the stock, as well as adding it to the glaze. As for ginger preserves, Buderim make a wonderful ginger marmalade which was a perfect addition, and as my family prefers a more deeply caramelised glaze, than Nigella's, I also drizzled the ham with extra sweetness.... golden syrup. My mind and soul abounded with inspiration, so I had to keep creating ....my next blank canvas was what to do for dessert. In keeping with family favourites them I decided on an ice-cream pudding. Quite a simple thing to make, all you need is some good quality vanilla ice cream and then the let your creativity stir ...by adding in your favourite sweet ingredients. Sometimes I add chopped dates and Arnott's Ginger Nuts, or Chocolate with Raspberries or Blueberries and lemon. Today however it was Cranberry, Cherry & Pistachio Nougat. Served with fresh Chirstmas cherries, so perfect at this time of the year, and a rich chocolate sauce. Though if you want a simply cripsy choc topping do what my niece and nephew did pour over some Choc Ice Magic and for an instantly set hard choc topping! May you enjoy the Christmas creations and all have a very delicious Christmas and a ‘bubbly’ New Year ! Place ham into a large stockpot, then pour over ginger beer and add cardamom pods. Bring to the boil, then reduce heat to low and cook, partially covered, for 3 hours. If ginger beer doesn't cover the top of the ham then reguarly ladle the ginger beer stock over the ham. Carefully lift ham out of the pot. Reserve ginger beer stock. Remove skin and some of the fat so only leaving a thin layer of the fat on top of the ham. Preheat oven to 220°C. ** In a bowl, combine ginger marmalade, mustard powder and Dijon mustard, cardamom and stir to mix. Spread over the top of the ham. Drizzle over golden syrup. Place onto a rack, over a foil lined baking dish. Pour 2 cups ginger beer stock in the base. Bake for 20 minutes or until glaze is sticky and golden. Let stand for 10 minutes. Meanwhile add pan juices to a deep frying pan. Blend flour with a cup of remaining ginger beer stock. Bring to the boil, stirring constantly then reduce heat and cook until thickened to a sauce consistency. * If you cannot get hold of ginger marmalade, use orange or lime marmalade and add one teaspoon of ground ginger. ** If pre cooking ham then do steps 1 & 2 and reserve ginger beer stock. Cover ham top of ham with non stick baking paper and then wrap in foil and let cool slightly before placing in the refrigerator. On the day of glazing you will need to bring the ham back to room temperature before baking. Bake in preheated 180°C oven for about 20 minutes to ensure that ham is well heated through then increase oven temp to 220°C and bake for a further 10 minutes or until as glaze is golden. Lightly grease 8 x ½ cup capacity ramekins, or dariole moulds, then line with plastic wrap so it covers base and the well over sides. In a large bowl combine ice cream, cranberries, dried cherries, chocolate and pistachio nougat and mix until combined. Spoon into lined ramekins, cover with plastic wrap. Place into freezer and freeze for 6 hours, or overnight. Remove from freezer. Carefully run a knife around the plastic wrap surrounding the puddings then gently lift out. Serve on individual plates with fresh cherries and chocolate sauce, if desired.